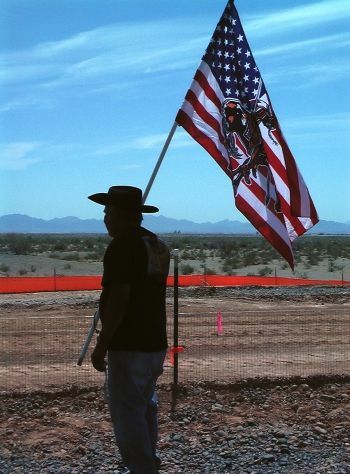 (BLYTHE, Calif.) – La Cuna de Aztlan Sacred Sites Protection Circle, acting to protect Native American Religious Freedom, filed a renewed application for a temporary restraining order (Case 2:11-cv-04466-JAK -OP) yesterday in United States District Court, Central District of California. 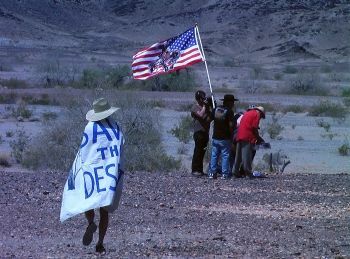 According to La Cuna attorney, Cory Briggs, in the “Request for TRO” (Temporary Restraining Order), defendant Bureau of Land Management’s “Right-of-Way Notice to Proceed” issued to defendant Palo Verde Solar I, LLC, on November 4, 2010, then subsequently received by the plaintiffs relating to the boundaries of the proposed Blythe Solar project, were in black and white and did not reflect actual boundary lines printed in red on the originals. Briggs continues, “When I saw the red lines on the color version of the Notice to Proceed, it became clear that the access road for the Blythe Project was going through a swath of land that was not included in the environmental impact statements description of the affected land: namely, the western half of the eastern half of Section 26 of Township 6 South, Range 21East, of the San Bernardino Meridian. Plaintiff La Cuna has alleged that construction, which began in May at the site of the German firm Solar Millennium’s Bythe Solar Project, endangers several large Native American geo-glyphs. The alleged destruction two large glyphs sparked protests recently at the site and at Solar Millennium headquarters in Oakland, CA. Solar Millennium is a partner with Chevron Energy Solutions in the project. The Blythe Geo-glyphs are not the only cultural resources endangered by a planned “build-out” of large solar in the Mojave Desert. According to the testimony of Elizabeth A. Bagwell, Ph.D., RPA and Beverly E. Bastian before the California Energy Commission, “This analysis estimates that more than 800 sites (Cultural Resource Sites–Sacred Sites) within the I-10 corridor, and 17,000 sites within the Southern California Region will be potentially destroyed (by large solar development in application with the BLM). The BLM denies any geo-glyphs are endangered, but La Cuna technicians indicate several remain on the project lands. Robert Lundahl’s video “Massacre in the Rocks,” specifies sites that are vulnerable (http://www.vimeo.com/24785962). La Cuna De Aztlan’s GPS coordinates for these sites are available to all parties. Indications are that the geo-glyphs may be very old. According to anthropologist Jay von Werloff et al., in a paper titled “AMS 14C Age Constraints on Geo-glyphs in the Lower Colorado River Region, Arizona and California, in Geo-archaeology: An International Journal, 1995, a representative sample of geo-glyphs along the Lower Colorado date from between AD 213 to AD 1408, with margins of error of between 57 and 392 years depending on the specifics of a particular glyph and the location. According to La Cuna de Aztlan’s Chairman, Patricia Pinon, the pressure of the ARRA “fast track” process approved by Secretary of the Interior, Ken Salazar resulted in inadequate Environmental Impact Statements and inadequate government-to-government consultation with the tribes and native groups. Bill Powers of San Diego based Powers Engineering, a solar energy consulting firm states, “So the Orwellian aspect of the government involvement in this process is that now instead of the analysis being focused on is this a cost effective project, is it a project that will minimalize or eliminate environmental damage, is it a good investment strategically for this state, all of that is secondary for the race to get the permit so that the project can get a 30 percent cash grant. In this case — that’s $600 million up front per project. So the money is so big that it’s now like a bull rush to the finish line.” In order to qualify for rebates, Solar Millennium needed to “break ground” at the site. So far, the company has graded a 100 ft. wide transmission corridor extending along the path of a former gas line road to Highway 10. Time is weighing against the defendants. On April 6, 2011, Ronald Liebert appearing at a scheduling conference in another proceeding on behalf of Solar Millennium, LLC, told the administrative law judge that the Blythe Project still did not have all necessary approvals and that it needed them by September 2011. 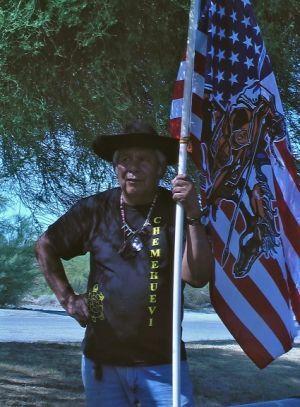 On December 28, 2010, La Cuna de Aztlan Sacred Sites Protection Circle filed complaints in United States District Court, Southern District of California, challenging the Bureau of Land Management permitting processes related to six large solar facilities planned for the Mohave, Sonoran and Colorado deserts of Southern California. The group was joined by CARE, Californians for Renewable Energy, and 6 individual Native American plaintiffs. Case numbers for complaints, now re-filed, are as follows: Blythe: 11-CV-04466, Ivanpah: 11-CV-00400, Chevron: 11-CV-00395, and Imperial: 10-CV-02664. Complaints referring to the Calico and Genesis projects have not yet been re-filed. Project applicants and the Department of Energy have since been named as defendants. The suits follow the filing of the Quechan tribe’s legal challenge to the imperial Valley Solar Project which was granted an injunction by Judge Larry Burns on December 15, Civil Action No. ’10CV2241 LAB CAB, United States District Court for the Southern District of California. La Cuna de Aztlan’s complaint, and now its “Renewed Request for TRO” (Temporary Restraining Order), add more impediments to industrial development of the deserts of California.